Help me make comics? Patreon. I dread the release of movie toys. They come out a week or more earlier than the film they’re tied to. That means with high profile films the toys have to be on the shelves ready for kids to buy as soon as they walk out of the theater, that also means key scenes and events that transpire in the film are depicted in play sets and action figures. 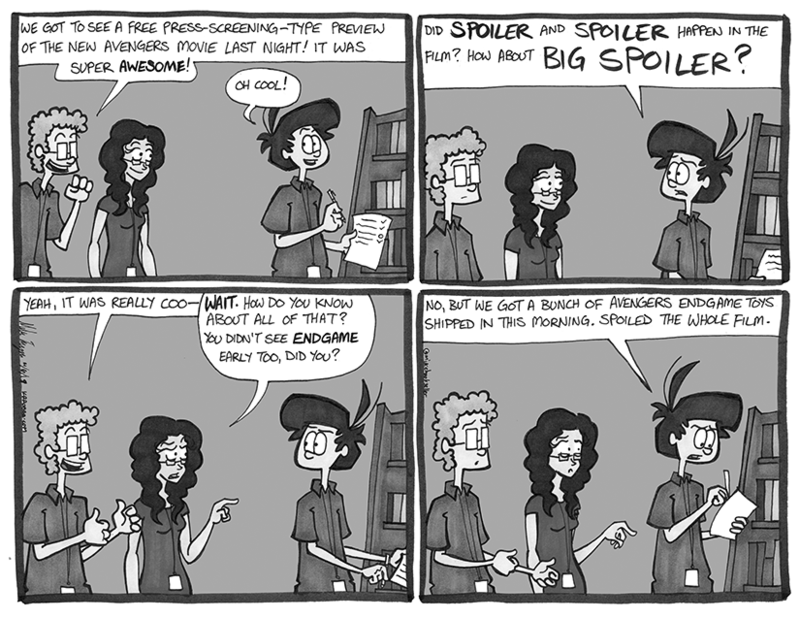 I have tried my best to avoid all spoilers for any movie I’m interested in watching. I like to go in fresh. I think that’s why The Lego Movie holds such a special place in my heart, more so than most because the movie is fantastic, I had no idea what to expect with the Lego Movie and I was blown away by the charm, humor, warmth, creativity, etc. One of the best films I’ve seen period. But we’re not talking about The Lego Movie, we’re talking about the Lego kits of Avengers. That and the action figures, Funko Pop bobble heads, and all of that stuff. We got a large shipment of that stuff in this past week and just seeing the toys, seeing which characters are made into action figures, kind of feels like they spoiled a bit of the movie for me. One less thing to be surprised at. Sometimes we get boxes of this stuff specially labeled and dated for a specific release. Not for these Avengers toys. Packed into generic brown cardboard.